The Paharpur Business Centre has more than 7,000 plants pumping fresh air into its offices. POLITICAL APATHY OVER the poisonous smog choking India’s capital has led many like businessman Kamal Meattle to take matters into their own hands, filling his office with thousands of plants he says pump air as fresh as from the Swiss Alps. From the outside, the Paharpur Business Centre looks like any modern office block. But inside it is a virtual jungle where rooms and corridors are lined with more than 7,000 potted plants and creepers. The greenhouse terrace, with artificial grass and green walls, houses an “air washing” system that moves polluted outside air through a series of cleaning filters. It is then pushed through the greenhouse where the plants remove bacteria, fungus, carbon dioxide and other toxins before the air conditioning pumps it to workers on the floors below. “It would be like working in Gulmarg in Kashmir or Davos in Switzerland in this building,” 73-year-old Meattle told AFP as he looked out at the smog from the protection of the lush rooftop nursery. “You are actually right now sitting in an air tank,” he said, referring to the greenhouse where PM2.5 – the most harmful particulates in the air – registered nearly zero compared with 415 outside, according to Paharpur’s monitoring system. A Massachusetts Institute of Technology graduate and trustee of Al Gore’s Climate Reality Project, Meattle began thinking about a clean office project years ago when he rejected doctors’ advice to move away from the polluted capital for his health. “I wanted a solution for myself and I didn’t want to leave Delhi,” he said. His centre, whose tenants include Amazon, Samsung and Microsoft, is now rated the city’s healthiest building by the Indian government, and Meattle says people who work there benefit from improved blood oxygen levels, better brain function, and fewer asthma and eye irritation cases. “What would have otherwise been a waste is captured and reborn to be used as a raw material again,” said co-founder Arpit Dhupar, donning a t-shirt that says “black is the new green”. The Army Polo and Riding Club recently ruled that horses used by the Delhi Army polo team must be allowed twice as many breaks to alleviate the physical stress of playing matches in toxic conditions. 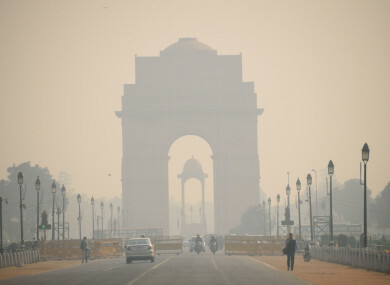 “By sheer logic and the levels of pollution that were there in Delhi we thought that it may cause a problem. The longer the pony plays, the exhaustion is that much higher,” said the club’s chief executive, Colonel Ravi Rathore. Email “India's capital is polluted with smog... but these Delhi offices have air as fresh as the Swiss Alps”. Feedback on “India's capital is polluted with smog... but these Delhi offices have air as fresh as the Swiss Alps”.